A 28 year old right handed hispanic female was admitted to the hospital because of intractable headaches and blurring of vision and double vision. The patient was well until a year ago, when she began to have bilateral occipital headaches with radiation to the forehead. The headaches were constant but exacerbated for an hour in the morning or evening, that would make her nervous, restless and photophobic. She had been seen frequently in an outside clinic before she was referred to our Center and had received treatment for a presumptive tension headache without improvement. The patient had an unremarkable family and social history. She had not been taking any medication prior to this illness. She had not used birth control pills. She reported herpes zoster skin lesions in a mid-thoracic dermatome in 1990 with complete recovery. Three months before admission to our Center, her headaches became more severe with nausea and occasional vomiting. The patient felt like "fluid was bouncing" in her head and ears. Her headaches were worsened when bending over or with sudden head movements, as well as in a lying position. The patient also began having pain in her shoulders radiating down to the elbows as well as in her hips radiating down to her knees. For three weeks prior to admission she noticed blurring of vision and occasional horizontal double vision while looking toward the left. Worsening of all these symptoms prompted admission to our hospital. The patient was afebrile and not in acute distress. Her height was five foot, four inches and her weight was 120 pounds (54 kg). The blood pressure was 110/60. The head was normal; the temporal arteries were not thickened or tender. The neck was not stiff. Kernig's and Brudzinski's signs were negative. General physical examination was normal. Visual acuity: OD 20/25; OS 20/50 (uncorrected). Pupils: Round, equal and reactive to light and accommodation. Goldman visual field perimetry showed bilateral enlargement of the blind spots. III-XII: Normal. 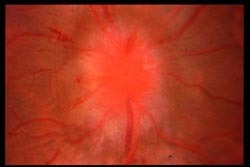 Red lens test did not unmask extraocular muscle weakness. Motor: Strength was 5/5 in all muscle groups. Reflexes: Reflexes were 2/4 in all extremities and no pathologic reflexes were found. Sensation: Normal tactile sensation as well as deep position and vibration sensation. Cerebellar: Normal finger-to-nose and heel-to-shin. There was no ataxia.